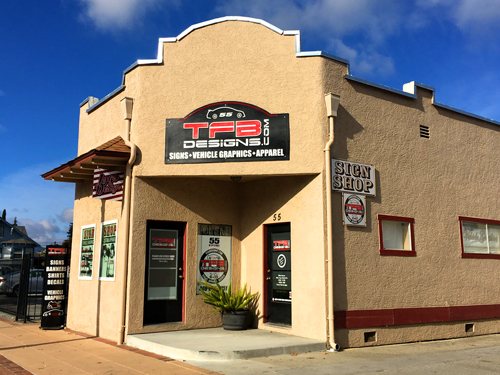 At TFB Designs we design and create vinyl graphics, apparel, signs and decals. We offer a unique line of products that can be customized to your liking. We are located at 55 W. 6th St. in Gilroy California. The products we offer are available in our store and through this website. All of the items we sell are designed and produced in the USA. 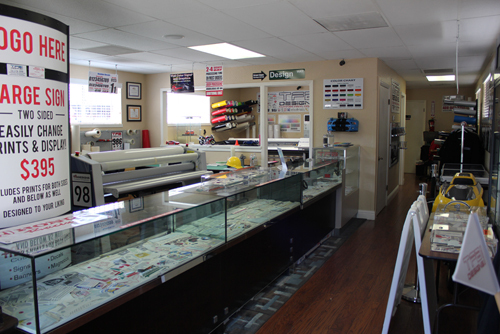 Our store is on 6th Street just one block from Monterey Road in downtown Gilroy. 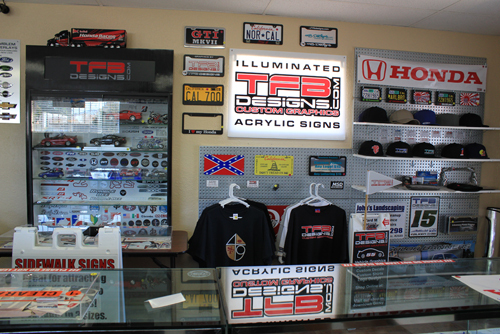 We have a variety of decals, apparel and signs on display. 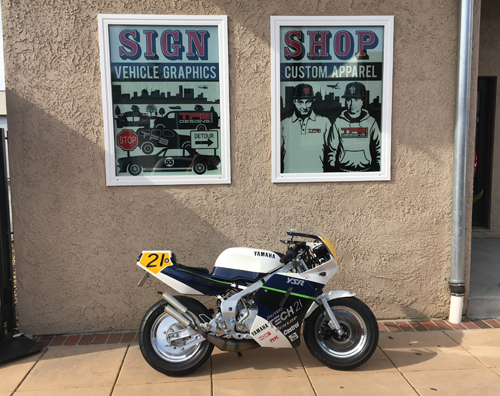 We also have project cars and motorcycles with our graphics installed around the shop. 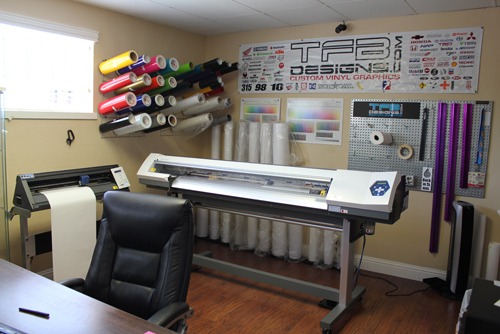 TFB Designs was founded by Tim J. Bostock in November of 2005. Tim graduated from San Jose State University with a BFA in art and design. The products we offer are designed by talented artists. We strive to create quality products that hold up well over time. Our neatly organized shop is filled with state of the art equipment, allowing us to offer a variety of products & services. The products we offer include vehicle graphics, signs, apparel, logo design, decals, and embroidery. Please click on the links above to learn more about the products and services we offer. There are many decal kits for cars, trucks, and motorcycles available through this website. If you do not see a graphic or decal you would like please contact us, we may be able to provide it for you. We are always working to create new vinyl graphic related products for vehicles. Along with designing and creating, we also install graphics, decals and signs. Many signs, banners, and company vehicles around the Gilroy area have been completed by us. Our turn around time is quick, and we are very knowledgable about the products and services we offer. We look forward to working with you.